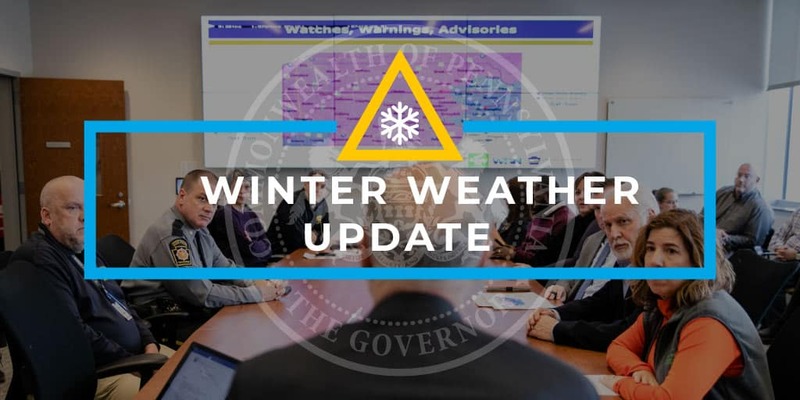 Harrisburg, PA – Governor Tom Wolf reminded Pennsylvanians and those traveling in the state to be vigilant as a winter storm continues throughout the day and overnight into Wednesday, changing over to a wintry mix moving north and east. As the storm winds down, more snow, followed by gusty wind conditions, could make driving treacherous. PennDOT and the PA Turnpike have implemented travel restrictions through the storm, which are being evaluated hourly. Depending on conditions, restrictions may be expanded or reduced. See a map of restrictions in effect, www.511PA.com. Governor Wolf signed an emergency declaration in January that authorizes state agencies to use all available resources and personnel, as necessary, to cope with the magnitude and severity of the storm’s impacts. The time-consuming bid and contract procedures, as well as other formalities normally prescribed by law, are waived for the duration of the proclamation. In addition to driving safely around plows, motorists are urged to drive according to conditions. If motorists encounter snow or ice-covered roads, they should slow down, increase their following distance and avoid distractions. Last winter in Pennsylvania, preliminary data shows that there were 440 crashes resulting in 221 injuries on snowy, slushy or ice-covered roadways where aggressive-driving behaviors such as speeding or making careless lane changes were factors. To report an accident or other emergencies on the PA Turnpike, dial *11 on your mobile phone. If there is an accident, move the car out of travel lane and onto shoulder, if possible, and stay in the vehicle. For more information about PA Turnpike conditions, follow the conversation on Twitter. You may also see advisories by clicking on the travel ticker on www.PATurnpike.com. Call your utility hotline about all outages – don’t assume that someone else has reported the problem. Stay clear of any downed power lines, along with trees or other objects that may be in contact with those lines. If you use a generator, do NOT run it inside your home or garage, and do NOT connect it to your home’s electrical system. Do not call 9-1-1 to report power outages unless it involves a dangerous situation, such as live wires on a road or a fire. The commission continues to monitor utility issues across the state and coordinate closely with the governor’s office and the other state agencies involved in storm response. Follow the conversation by using #PAWinter on Twitter and visit the department on Facebook to view a winter emergency kit video.